Closest hotel to the Gale Center, next to Niagara Falls, Hornblower Niagara and Casino Niagara. This couples & family-friendly hotel is located along the beautiful Niagara River within walking distance to the many attractions Niagara Falls has to offer. 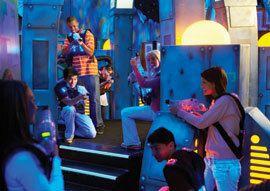 Just a short 3 km from the majestic falls and all the fun of Clifton Hill, Niagara attractions and casinos. 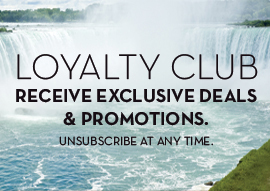 Our hotel offers a variety of packages to suit your every vacation need, including Casino packages (Niagara & Fallsview), Wine Tour excursions and Family Fun packages! Ramada By Wyndham Niagara Falls By The River features an indoor pool and fitness centre. 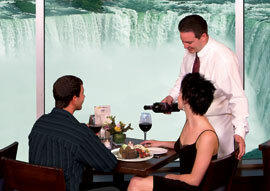 Nearby Niagara restaurants are just a short drive or WEGO shuttle ride. Reservations will happily be arranged for your convenience at the front desk. All 108 rooms at Ramada By Wyndham Niagara Falls By The River, include flat screen TVs with cable and Pay Per View movie channels, hair dryers and coffeemakers. Some rooms include pullout sofas. Additional amenities include fridges & roll away beds, which can be arranged for a small fee. The Ramada By Wyndham Niagara Falls By The River is located conveniently near major Niagara Falls attractions including Journey Behind the Falls, Hornblower Niagara Cruises, Fury, and more. 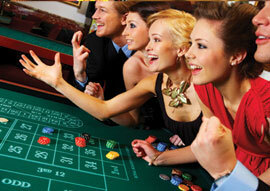 The famous Clifton Hill district & The Fallsview Casino Resort are just minutes away. 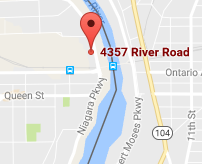 There are restaurants to suit everyone in Niagara Falls. Within the immediate area of the hotel the choices seem endless...The IHOP, The Outback Steakhouse, The Keg Steakhouse & Bar, East Side Marios, Starbucks, and the list goes on. Looking for atmosphere? The Keg Steakhouse & Bar offers a truly inspiring view of the Falls while enjoying food prepared by world class chefs. Niagara Falls has so much to offer and the Ramada By Wyndham Niagara Falls By The River is the perfect choice for enjoying your stay in Niagara Falls. Visit the Front Desk to schedule our Restaurant Shuttle available at your convenience for transportation to nearby recommended restaurants.